Archaeologists have discovered some of the earliest evidence of turkey domestication during an excavation of the ancient Mitla Fortress in Oaxaca, Mexico. The Field Museum has been exploring the hilltop fort in the Valley of Oaxaca that was inhabited by the Zapotec from the Classic period (200-850 A.D.) until around 1200 A.D. 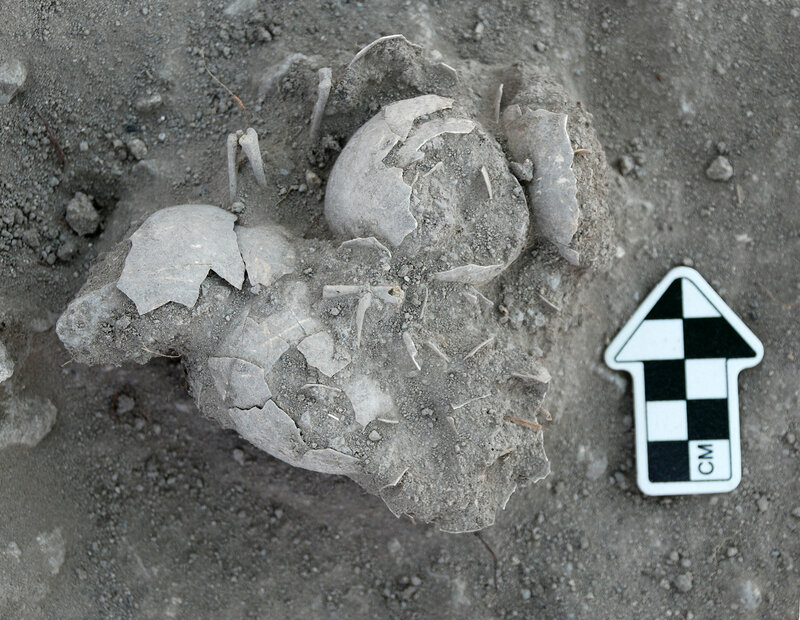 In 2009, the team unearthed a clutch of intact turkey eggs buried under two of the fortress’ households. “It was very exciting because it’s very rare to find a whole cluster of intact eggs. This was very unexpected,” says [Field Museum archaeologist Gary] Feinman. 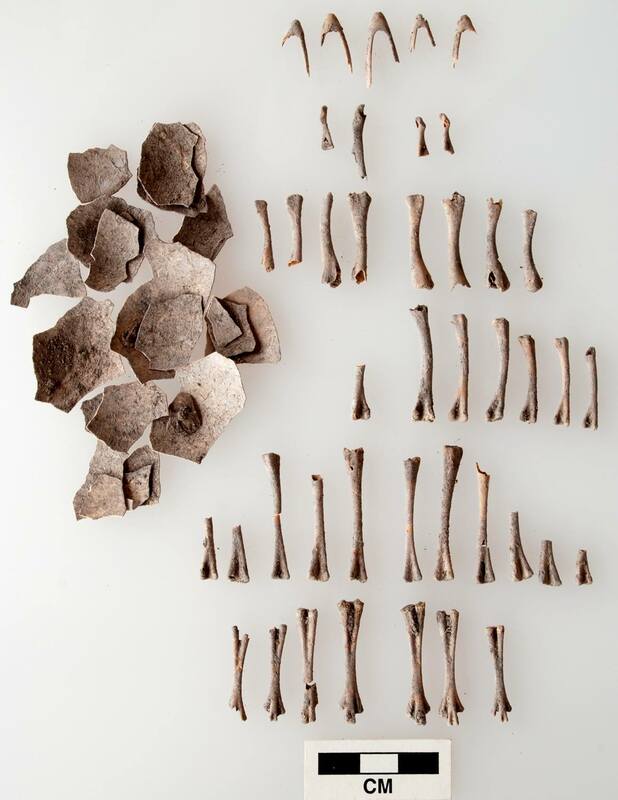 “Heather Lapham is an archaeologist who studies animal bones, and she knew immediately that we had found five intact or unhatched eggs that were left as an offering alongside seven newly hatched baby turkeys, of which only their tiny bones survived,” says Feinman. Scanning electron microscope analysis of the eggshells confirmed that they were indeed laid by turkeys. The Zapotec made sacrifices to the gods before constructing a new house, and a turkey hatchling was sometimes the blood sacrifice of choice. The animal would be killed, its meat eaten and the remains buried under the floor. To have such a wide range of turkeys at every stage of development — hatched and unhatched eggs, unfertilized, newly fertilized eggs, almost hatched eggs, newly hatched poults, juveniles, adults, hens, including at least one of egg-laying age, and toms — available for ritual use in their home, the Zapotec must have had a breeding operation nearby. The eggs date to between 400 and 500 A.D., which is the earliest concrete archaeological evidence of domesticated turkeys in southern Mexico. The oldest turkey bone found in southern Mexico dates to 180 A.D., but it’s just a single bone and was found in a cave, so there is no direct evidence that it was domesticated. The oldest confirmed evidence of tamed turkeys in northern Mexico date to 500 A.D., but these are scarce. The preponderance of domesticated turkey remains begin appearing in the archaeological record in 900 A.D. In addition to the sacrificial turkeys, the team also discovered eggshells and more than 300 bones of juvenile and adult turkeys in household trash pits. A hundred or so more turkey bones were found carved into jewelry or tools. The research team has DNA tested to the remains to identify which subspecies of native turkey they belong to, but the results have not come in yet. Their findings have been published in the Journal of Archaeological Science: Reports. This entry was posted on Thursday, November 24th, 2016 at 11:18 AM	and is filed under Ancient. You can follow any responses to this entry through the RSS 2.0 feed. You can skip to the end and leave a response. Pinging is currently not allowed. Happy turkey day to you too. Livius Drusus! We say what we are grateful for today in my family. I wish to say that I am grateful for you and for thehistoryblog.com. It has lightened up my life and given me laughter, amazement, and much to ponder. It has been and continues to be a joy, a sorely needed one, especially during this illness of mine. Indeed, happily sacrifice your sacrificial turkeys ! A well-kept secret, i.e. outside of India and Turkey, so far known to few, is that the expression for ‘turkey’, or ‘chickaja indiska’, is in Turkish ‘hindi’, while the Hindi expression is ‘पीरू’ (‘piru’, or ‘devil’ and ‘worm’ in other languages like Finnish and Japanese). I wonder if my family in America is sitting around today fashioning jewelry and tools from yesterday’s bones? Usually turkey soup is the extent of our recycling activity. This post inspired me to make turkey en mole. Not bad for winging it.